PETALING JAYA: Property players are hoping that Budget 2013 would introduce encouraging policies or tax adjustments that allow businesses to thrive in the current local and global economic environment. Mah Sing Group Bhd managing director Tan Sri Leong Hoy Kum hopes to see new financial incentives, tax breaks or even infrastructure projects that will directly and indirectly benefit the sector as it is a key growth pillar for the economy due to its impact on more than 140 industries. “We hope there will not be any policies or requirements which will increase the cost of doing business. At the same time, we hope for measures to reduce compliance cost, ultimately promoting the property market,” he said in a statement. Leong explained that by reducing compliance cost, it would directly reduce the cost of doing business and the savings passed on to buyers would improve the affordability of the properties. He suggested some measures to increase affordability such as charging tariff-based utility fees, limiting the requirement of land to be surrendered to improve the efficiency of land use and applying plot ratio instead of density to encourage smaller, more affordable units and at the same time reduce land cost per unit of property. He also suggested reducing stamp duty so that the cost of property and home ownership could be reduced. “We propose that the stamp duty be reduced to 0.5% for the first RM300,000, 1% between RM300,000 and RM1mil and 2% in excess of RM1mil,” he said. To minimise the Government's loss of income, Leong said that maintaining a favourable real property gains tax regime could potentially increase sales and stronger growth of property and housing industry, which in turn bring in higher stamp duties due to higher transactions. To further stimulate the property sector, Leong recommended a tax relief extended to all interest incurred on end financing for the first home. “Alternatively, the Government could consider providing grants of up to 10% of the purchase price of affordable properties, to first-time home owners,” he said. Leong also hoped that the Government would further ease policies to encourage foreigners to buy properties in Malaysia. “As foreign purchasers account for only 2% of property transactions in Malaysia, this will not be a big cost to bear, and at the same time, can project a pro-investment image to the world at large,” he said. On another note, Leong said that with the escalating pressure of higher cost of goods, the Government could consider reducing the personal income tax rate or increase personal income tax relief to raise disposable income. “As a business friendly measure to encourage economic growth and to be in line with regional practices, we hope to see a reduction in corporate income tax as well,” he said. It was also reported that property and plantations group Tradewinds Corp Bhd had hoped for measures to sustain domestic economic growth in the wake of the uncertain world economy. Chairman Tan Sri Megat Najmuddin Megat Khas said concerted efforts were needed for Malaysia's economy to continue to expand in order to cushion the impact of the current sluggish global economy. He noted the bearish European economy and slowing growth in China has rubbed off on the local economy. “We've to find our own solutions (to our own problems). We should not merely rely on other countries. Unfortunately, our country is still dependent on imported goods. Hence, we should improve on our competitiveness to produce more competitive products,” he said. PETALING JAYA: Spurred by its profits tripling in the financial year 2012 (FY12), Land & General Bhd (L&G) now aims to break away from the mid-range developer category, with the target to increase its market capitalisation beyond RM300mil and profits above RM40mil. Managing director Low Gay Teck said a majority of listed property companies in Malaysia fell in that market cap and earnings range, hence the group intended to use that benchmark to push forward. To achieve that, the group plans to expand its core business in property through high-value projects in Klang Valley as well as Penang and Johor Baru. Low said L&G was already in talks with landowners in Penang and Johor Baru while its premium condominium Damansara Foresta in Bandar Sri Damansara would be entering its Phase 2 soon. In its annual report, the group noted that it had begun positioning itself as a premium developer in the local property market through its lifestyle-centric residentials like Damansara Foresta and The Elements @Ampang as well as modern business suites 8truim in Bandar Sri Damansara. Low said that while the group did not have a large landbank at the moment, its strategy was to develop projects on coveted land that could generate the good returns per acre. “We do not look at the acreage but how the land we have can generate most revenue and profits,” Low said after the AGM. That said, L&G still has 36 acres in Sungai Petani and 14 acres of industrial land in Johor undeveloped under its property division. In total, L&G has 318 acres of landbank for property development. In the nearer future, he said the group would be working on its Tuanku Jaafar Golf and Country Resort in Negeri Sembilan, at a gross development value (GDV) of RM555mil, which was in the final stage of getting approvals. “We hope to get the approvals within the next two months. The 200-acre project would take about five years to complete after its launch,” he said. For the next three financial years, L&G sees its GDV at more than RM2bil from all its ongoing and new projects. PETALING JAYA: Developers can now submit entries for a pre-qualification process to be in the running for Kwasa Land Sdn Bhd's proposed Kwasa Damansara development which sits on 2,330 acres of land in Sg Buloh. As the master developer, Employees Provident Fund's wholly-owned subsidiary Kwasa Land will conduct a pre-qualification exercise to get participants with required track record and expertise to undertake parcels of mixed development projects. Participants will be assessed based on their paid-up share capital or shareholder's fund, pre-tax profit for the last three consecutive years, gross development value, net gearing ratio and recognition. The exercise is classified into three categories namely: Tier 1 with a paid up share capital or shareholders' fund of at least RM1bil; Tier 2 with a paid up capital or shareholders' fund of at least RM300mil; and Tier 3 comprising bumiputera developers with a paid-up capital or shareholders fund of RM1mil and above. Bumiputera developers may also participate in either Tier 1 or Tier 2 categories subject to their qualification. The township will serve a target population of 150,000 when ready. Prior to the opening, Dijaya Corp Bhd has expressed interest in this project. According to a report, developers that match Kwasa Land's criteria include Malaysian Resources Corp Bhd, IJM Corp Bhd, Sime Darby Bhd and SP Setia Bhd. Companies which are interested can visit the Kwasa Land corporate website at www.kwasaland.com.my to download the form for the pre-qualification exercise. The closing date for all submissions is noon, Sept 26, 2012. 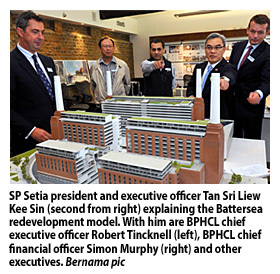 SP Setia president is optimistic that the Battersea redevelopment would fetch good sales given that it is located in Chelsea, which is relatively London's most expensive area. 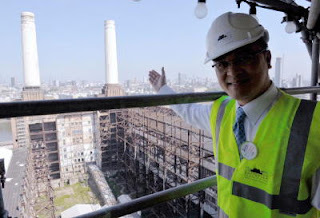 Redevelopment of the iconic Battersea Power Station (BPS) here by a Malaysian consortium is expected to begin in April, after a soft launch in January. The consortium comprising Sime Darby Bhd, SP Setia Bhd and Employees Provident Fund (EPF), on Tuesday took ownership of the 15.78ha site after paying STG400 million (RM1.98 billion) to BPS liquidators. About STG300 million (RM1.48 billion) of the payment came from a bridging loan by CIMB Bank, while the remaining was from the stakeholders' own cash based on their respective equities in the new joint venture called Battersea Project Holding Co Ltd (BPHCL), senior Sime Darby and SP Setia executives said. Sime Darby and SP Setia each own a 40 per cent stake in BPHCL, while the balance is held by EPF. "As of 10.25am today, we are the owner of this old power station. We have worked so hard on (getting) the site," SP Setia president and executive officer Tan Sri Liew Kee Sin told Malaysian reporters here. There were several failed attempts to redevelop the site by previous owners but Liew is confident that the consortium will not fail like others before it. For one, the consortium's scheme comes with good public amenities and transport solutions. "None of the schemes before this had a solid public transport solution. That is why we firmly believe the project can become a reality," he said. Liew is optimistic that the Battersea redevelopment would fetch good sales given that it is located in Chelsea, which is relatively London's most expensive area. He cited that the recently-completed Chelsea Wharfbridge project nearby had fetched sales of STG1,000 (RM4,940) per sq ft (psf) for its apartments, while certain developed areas in Chelsea can fetch as high as STG2,000-STG3,500 (RM9,880 to RM17,290) psf. Battersea Power Station, with its four iconic 350-foot (105-metre) chimneys, has been dormant since 1983, and the consortium expects the project to have a gross development value (GDV) of STG8 billion (RM39.5 billion) over its planned 15-year redevelopment. Sime Darby chief operating officer Datuk Abdul Wahab Maskan suggested that the consortium had paid reasonably cheap for the site given that the STG400 million (RM1.98 billion) price tag is equivalent to just five per cent of the project's expected GDV. "This is low compared to the land cost in other cities. In Kuala Lumpur for example, the land cost accounts for about 25 per cent of the GDV," Abdul Wahab said. The Battersea site was placed into administration with Ernst & Young last year after Lloyds Banking Group and Ireland's National Asset Management Agency called in debt against the struggling Irish developer, Real Estate Opportunities, which controlled the asset. The Grade II listed former power station is situated on the south bank of the River Thames and is within the larger 119-hectare Nine Elms corridor regeneration, BPHCL officials said. The BPS is arguably the last significant piece of prime central London land remaining for redevelopment, BPHCL chief executive officer Robert Tincknell said. 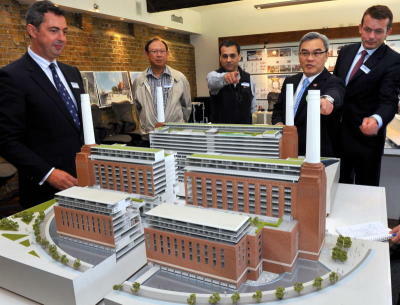 The Wandsworth Council had granted the planning consent (equivalent to development order in Malaysia) for a masterplan for the power station redevelopment in December 2010, Tincknell noted. The approved scheme comprises 3,500 private and affordable homes, 160,000 square metres of new office space, 56,000 sq m of retail space and nine hectares of public realm. The plan includes a sustainable mixed development comprising residential and commercial units while the power plant with its chimneys will be conserved and preserved, Liew said. There will also be a hotel and two new London underground stations, which would extend from the Northern Line. 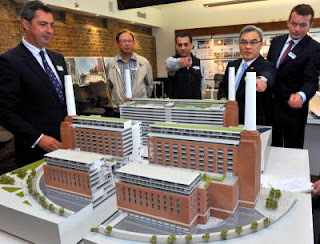 LONDON: The Malaysian consortium comprising property developers S P Setia Bhd, Sime Darby Bhd and the Employees Provident Fund becomes the official owner of the 39.5-acre Battersea Power Station site after paying £400mil (RM1.99bil) on Tuesday with a £300mil bridging loan from CIMB, said S P Setia president and CEO Tan Sri Liew Kee Sin. The remaining £100mil was paid as per the equity stake of each of the three consortium partners, with both S P Setia and Sime Darby forking out 40% each and EPF the remaining 20%. This will be the first and the largest property development for both Sime Darby and S P Setia in Britain with a gross development value of £8bil (RM39.8bil). The completion of the purchase saw the boards of Sime Darby and S P Setia and a team from EPF descending on London along with analysts and the press. Minister in the Prime Minister's Department Datuk Seri Idris Jala and London mayor Boris Johnson gave speeches to mark the official cocktail held on Wednesday evening. A newly-minted British company Battersea Power Station Development Co Ltd has been formed “a few days ago” with a logo of the Battersea Power Station and its four chimneys. This team from Battersea Power Station Development Co comprises the technical, management and financial team from those previously involved in the Battersea Power Station when it was owned by Irish firm Real Estate Opportunities (REO) before the site was placed under administration last year. The newly-formed company's chief executive officer Robert Tincknell, who has been employed by REO for the last 10 years, will manage the project. “Now that the project is fully paid, the next step is to work out the financing structure, whether it will be in Sterling pounds, whether it will be issuing of sukuk and seeking the best rates among banks,” said Liew. The financing team headed by Battersea Power Station Development Co chief financial officer Simon Murphy and those in Kuala Lumpur “will find the best structure going forward for the long term,” said Liew. “We will enhance the value of the site,” he said. What is important at this juncture is that the site is purchased clean of liabilities and it comes with an approved planning consent. The master plan is being done by renowned award-winning architect Rafael Vinoly. The master plan will feature 3,400 new homes, 160,000 sq m of new office space, 56,000 sq m of retail and 9 ha of public parks and spaces. Besides the long-term financing structure, the next step is to plan the development of phase one. This will comprise the development of the residential units next to the power station and the refurbishment of the power station itself. The units will be officially launched next year with construction to begin in April. On comments that the deal hinges on contributions to British infrastructures, Liew said that other than the purchase price of £400mil, the consortium had to contribute £211mil over the duration of the 10- to 15-year project for infrastructure works. “This is to be paid on a staggered basis as we go along,” he said, The first portion of £38mil will be paid in two equal portions of £19mil each in 2014 and 2015. A major portion of £203mil will be for the extension of the Northern Lines, which involves the development of two stations with one of them at the power station site itself and the remaining £8mil for other infrastructural works. He said this contribution towards infrastructure works was not due only from the Malaysian consortium but from other developers whose projects would benefit from the extension of the Northern Line calculated at a certain rate in proportion to the land they own and planned for development. Liew said the fact that planning consent was already given by the British authorities and that there were already plans to extend the Northern Line close to the power station by the local authorities were huge plus factors. Other features which add premium to the site are the nearby 200-acre Battersea Park, River Thames frontage and Chelsea and Sloan Square located on the other side of the Chelsea Bridge. The site is also part of Vauxhall Nine Elms' largest urban regeneration project in central London. Sime Darby president and group chief executive Datuk Mohd Bakke Salleh said the support given by the British government was tremendous. “The British are very keen to develop and regenerate the site and this support will work for all parties concerned,” he said. On who would be the target purchasers, Bakke said the project would be sold to everybody. “London has a huge global market. The fact that the eurozone is facing some challenges at the moment has also enhanced the safe haven aspect of British properties,” he said. KUALA LUMPUR: Bandar Raya Developments Bhd’s (BRDB) wholly-owned subsidiary, Raintree Forest Sdn Bhd has entered into a joint-venture (JV) agreement with Garuda Mega Sdn Bhd for the proposed residential development on Sungai Long land on a JV basis. In a filing with Bursa Malaysia, BRDB said the estimated gross development value of the proposed residential development on Sungai Long land, measuring 25.97 ha, was RM600mil. Phase one of the proposed development was targeted to be launched in the second quarter of 2014, it said. “The proposed JV represents an opportunity for BRDB to participate in viable development projects without having to bear the substantial upfront costs of acquiring land and to replenish its development landbank,” BRDB said. The company also said the proposed JV would contribute positively to its future earnings. The company intends to fund the proposed JV and the proposed development costs through internal generated funds and/or bank borrowings. KUALA LUMPUR: Bandar Raya Developments Bhd (BRDB) wholly-owned subsidiary, Raintree Forest Sdn Bhd, yesterday has agreed to jointly develop a 25.9ha freehold land owned by Garuda Mega Sdn Bhd in Cheras, Selangor. Both parties are planning a residential development comprising bungalows, semi-detached houses and apartments with an estimated gross development value of RM600 million. Phase one of the project is targeted to be launched in the second quarter of 2014, it told Bursa Malaysia yesterday.